Literacy really does begin at home during those cuddly moments when you and your child share a book. Reading with kids from birth helps them develop the skills to become proficient readers and instills a life-long love for books of all kinds. Even before babies can talk, they’re listening and learning, and as they grow children continue to love spending special times with parents and grandparents hearing stories and discovering the world through books. You don’t have to mark Family Literacy Month only in November – make it a year-round celebration! Image copyright Ying-Hwa Hu, 2017, text copyright Ellen Mayer, 2017. Courtesy of Start Bright Books. Her little one giggles as they head for the dairy aisle for yogurt. Here, the child’s wish for “‘MORE!’” is granted, and Mama lets her little one hold the containers. “‘One, two—one for each hand,’ says Mama.” The child laughs and kicks, excited to help. As they pass through the fruit section, the toddler grabs a banana from the display and holds it up triumphantly. Mama is happy to add the one banana to the cart to eat later. “‘Look—one banana for one hand!’” she points out. At check-out, Mama names each item and the quantity they are buying as she puts the banana, yogurt, carrots, potatoes, milk, and other things on the conveyor belt. But her little one wants to help too! Suddenly, one of the stuffed bunnies is riding toward the smiling clerk on top of the roll of paper towels. Back home, it’s time for a snack. As Mama cuts the banana in half, her toddler proudly exclaims, “‘TWO!’” showing an understanding of the concept of two. A note for parents, grandparents, and caregivers by early math expert Deborah Stipek is included. Gender neutral clothing and hair and the absence of personal pronouns in the text make this a universal book for all children. Ying-Hwa Hu’s exuberant illustrations of mother and child will make little ones and adults smile. Cheerful eye contact between the two shows the love they share and their enjoyment in spending time together. Colorful boxes and containers line the grocery store shelves, giving the pages a fresh and sunny feel. The items Mama adds to the cart are clearly shown in quantities of one and two. Little readers will love the adorable stuffed bunnies and join in the toddler’s pride as they too recognize the ideas of one and two. Banana for Two makes an excellent shower or new baby gift and will quickly become a favorite at home and in preschool classrooms or programs. 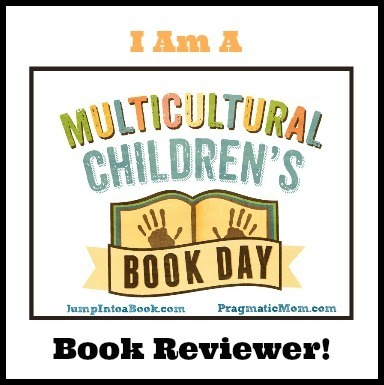 To discover more about Ellen Mayer and her books as well as find lots of resources for adults and fun activities for kids, visit her website. Learn more about Ying-Hwa Hu and her art, and her books, visit her website. Little ones love to pretend to go grocery shopping! With the printable game pieces and instructions here, you and your child can fill a bag with items in quantities of one and two and share some math fun! After printing the Math Fun Is in the Bag template, talk with your little one about the quantity of items in each picture. Even if your child is not talking yet, they are listening and learning. 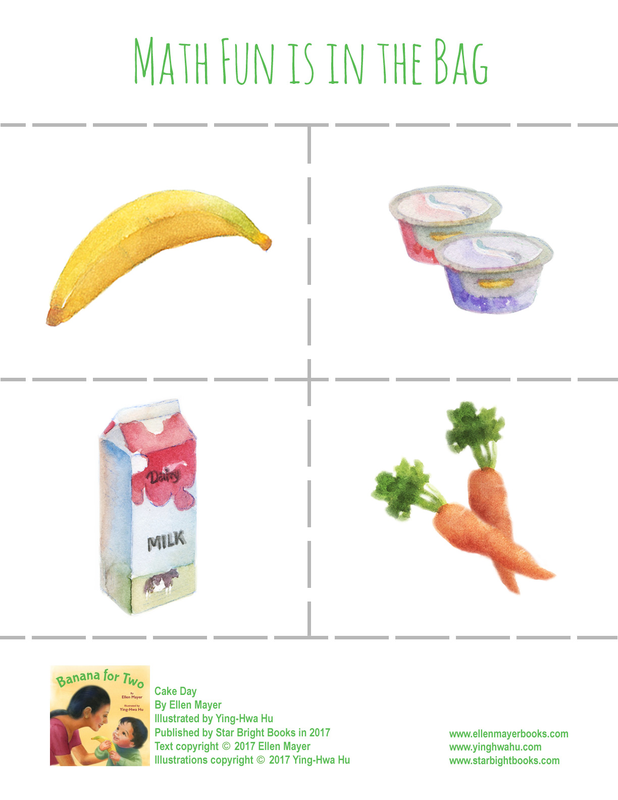 For older children, print two (or more) copies of the Math Fun Is in the Bag template and have them add two bananas, two cartons of milk, four carrots, and four containers of yogurt to the bag. Older children may also enjoy paying for their groceries with pennies in quantities of one or two (or more). Set a price for each item and help children count out the coins needed to pay for them. You’ll find more Math Fun, including printable bunny puppets to make, pretend play suggestions, and tips for talking about two on Ellen Mayer’s Website!